“I found out about this banjo in 2010 and didn’t think too much about it since I was not in the market for Gold Stars. However, the design was unusual and the price was very low – it was on consignment. The owner was evidently not impressed with it. At any rate, it had a two-week return policy so I decided to take a chance since I have always like the Gibson 49 Classic upon which this is based. 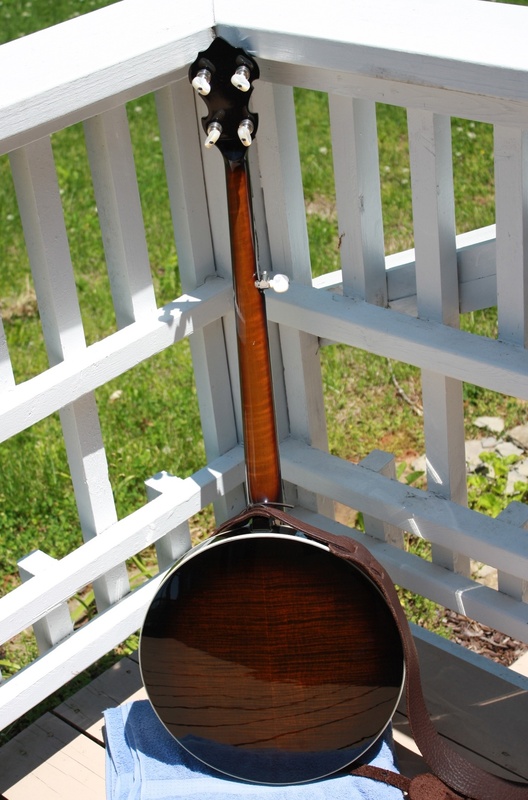 (Earl’s banjo had been sent back to Gibson for replacing the fingerboard in 1949, or thereabouts, and when it was returned, he found Gibson had replaced the fingerboard with the then current ‘bow tie’ pattern rather than the Granada “hearts and flowers’ patter original to the instrument.) At any rate, he played the banjo for a few years with this configuration and made some of the classic recordings with Lester Flatt using the banjo. Gibson then did a re-issue in the 1990s and Gold Star built this model in 2009 as a limited production (twelve instruments) for a dealer who supposedly experienced financial difficulties and the banjos seemed to find their way to several dealers. When I received this instrument, I found the original owner had evidently tried to adjust the string height by over tightening the coordinator rods. That caused the pot to be under stress and the tone of the instrument was very harsh. I set the coordinator rods to neutral again (taking the stress off the rim and pot), tightened the head to g# and the tone improved tremendously. I knew there was a great instrument here waiting to be adjusted. At this point, I took it to Arthur Hatfield and he went over it very carefully, adjusting tension of head, rods, etc. and we selected one of Arthur’s compensated bridges that seemed to my ear to bring out the best tone and playability. 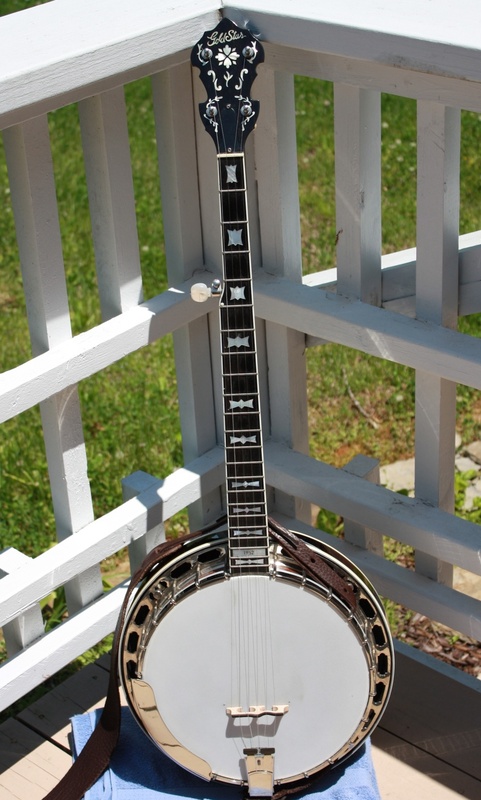 The banjo has excellent fit and finish and early on I had considered selling, but now it has impressed me so much with its playability and tone that again, this is an instrument that I will be reluctant to sell. It has the classic maple tone – crisp, yet sweet that I really like.